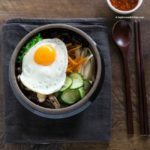 Learn how to make dolsot bibimbap with or without a Korean stone bowl! I’m very excited about sharing my recipe today. It’s a dolsot bibimbap day! Many of you already tasted my super duper delicious bibimbap recipe in the past few years and might be wondering why I’m doing another post about it? Well, my main reason is that I’m sharing great tips on how to make dolsot bibimbap (with or without the dolsot aka Korean hot stone bowl). Are you excited? Bibimbap (비빔밥) is Korean mixed rice. 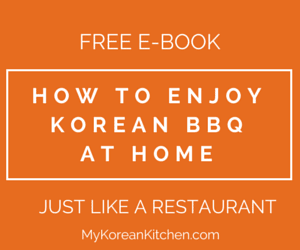 It includes rice, your choice of Korean side dishes and the bibimbap sauce. You typically serve these in a (mixing) bowl or in a hot stone bowl. Once served, you mix them all together nicely and shove them into your mouth. It’s super delicious and hugely addictive. Now, dolsot bibimbap (돌솥 비빔밥). It is bibimbap served in a sizzling hot stone bowl. 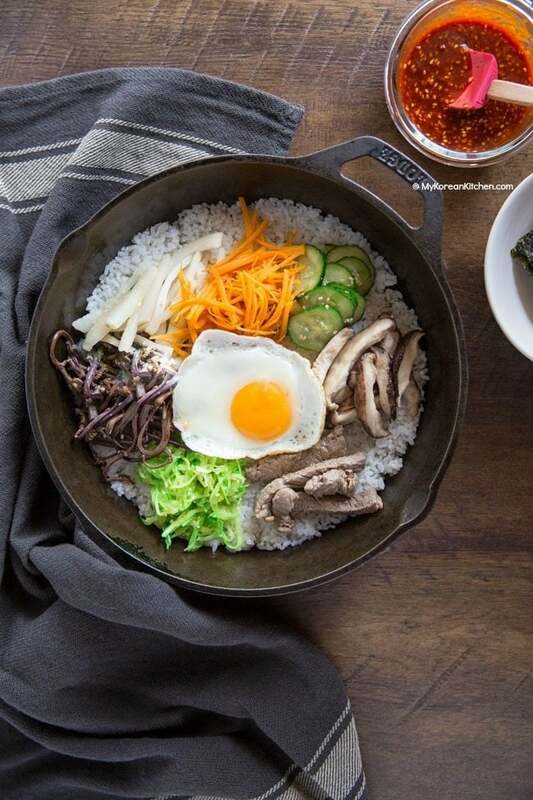 Some people seem to think all bibimbap is served in this hot stone bowl, but that’s not the case. Dolsot can be a raw stone bowl or a ceramic / clay bowl. At my home, I have a ceramic bowl. I use this bowl to make some of the Korea’s finest stew (e.g. Soondubu Jjigae and Kimchi Jjigae) too. If you serve bibimbap in a normal bowl, you will notice that the rice cools down quite fast. There’s nothing wrong with that. However, some people prefer having the rice and all the other ingredients in bibimbap warm if not hot. That’s when the stone bowl comes in handy. 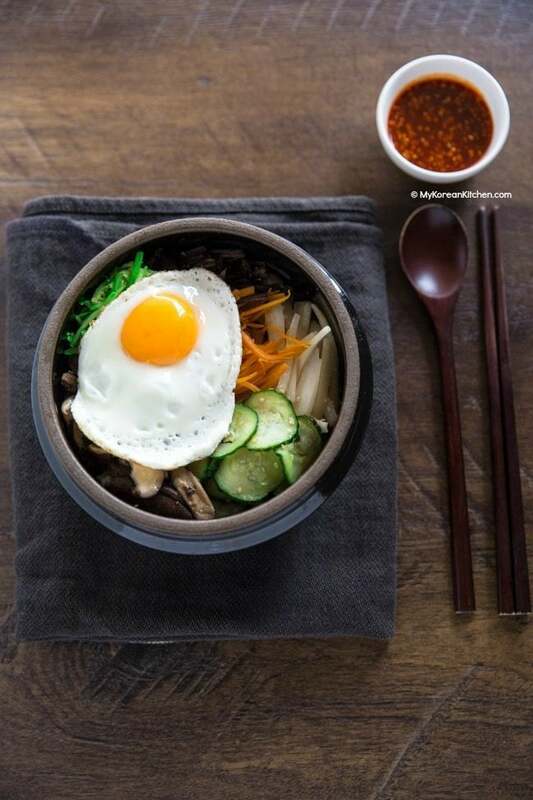 If you prepare and serve your bibimbap in a hot stone bowl, your bibimbap will be not only nicely warm, but also it will often have a nice crispy layer of rice at the bottom of the bowl. When I make bibimbap at home, I used to just serve it in a bowl. Because a raw stone bowl or ceramic bowl only works on a gas stove and I have an induction stove at home. Then, a brilliant idea struck a few months ago that I could perhaps try using my favorite cast iron skillet to serve my “dolsot bibimbap”. 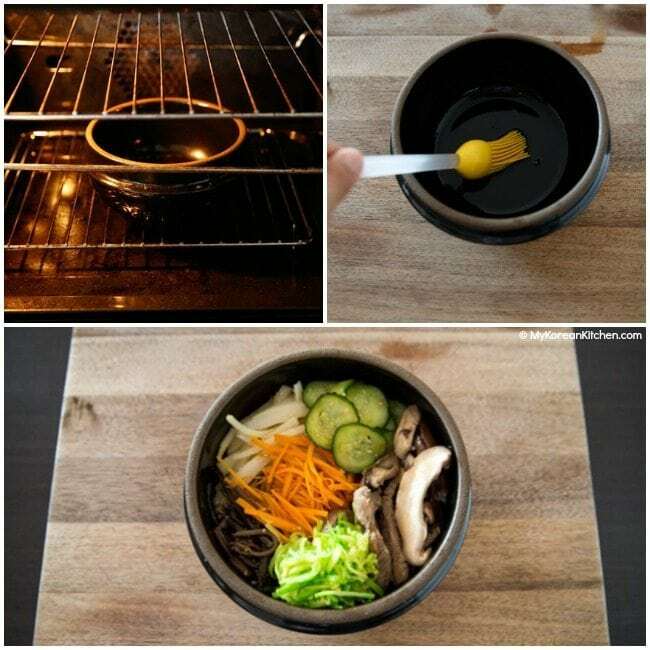 And, I have to say I absolutely love cooking my bibimbap this way! Seriously, you can get the “dolsot bibimbap effect” by simply cooking it in a skillet and what’s more, it’s faster and easier! I’m sure you will love this idea too. I even included a short demo video of it below as well. Now, it’s time to learn how to make dolsot bibimbap the official way! Enjoy! 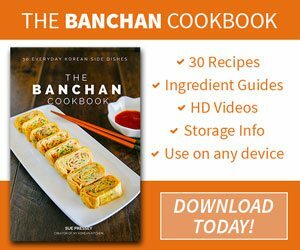 Feel free to check out my 3 other bibimbap sauces too! 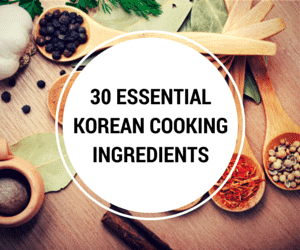 If you want to learn more about Korean ingredients, check my 30 essential Korean ingredients list! Handle with care while transferring the hot stone bowl. 1. Prepare and cook ingredients as below. 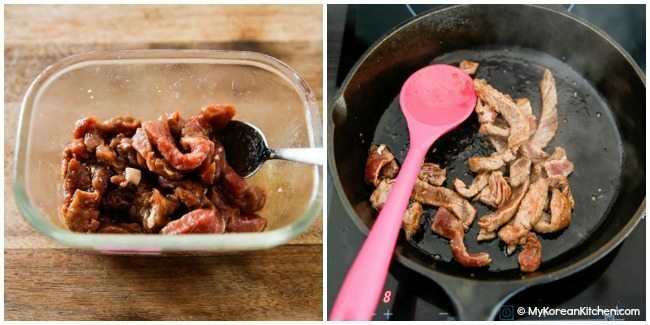 – In a bowl, combine the meat with the marinade. Cover the bowl and leave it in the fridge while you are working on other the ingredients. When ready, Add some cooking oil into a wok and cook the meat on medium high to high heat. It takes about 3 to 5 mins to thoroughly cook it. – Prepare the Korean cucumber side dish, fernbrake side dish and bellflower root side dish per the linked recipes. These can be prepared on a different day to save your bibimbap making time. – Separately sauté carrots, zucchini and mushrooms in a frying pan. Season them lightly with fine sea salt. 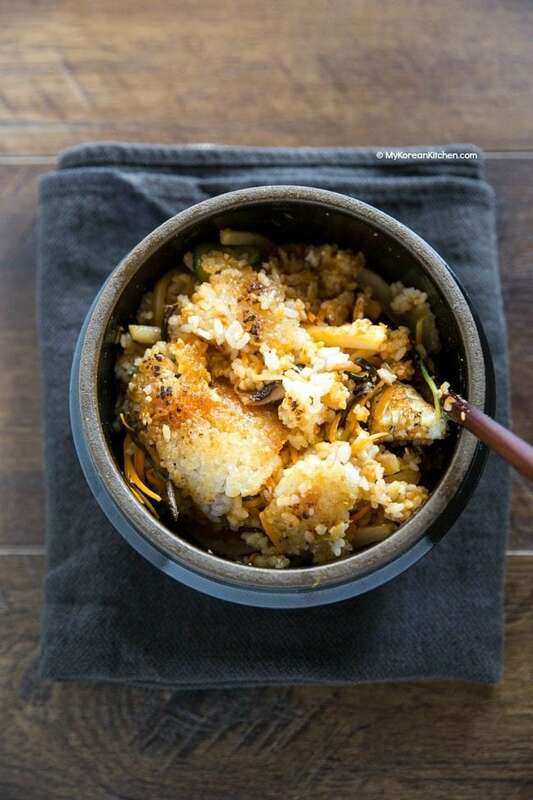 – Mix the bibimbap sauce ingredients in a small bowl. Set aside. 2. Preheat an oven for 10 minutes at 220 C / 428 F. Once heated, place your stone bowl into the oven. Leave it there for 10 minutes. 10 minutes later, take it out. Drop in some sesame oil (about 1 Tbsp per medium size bowl) and brush it around. 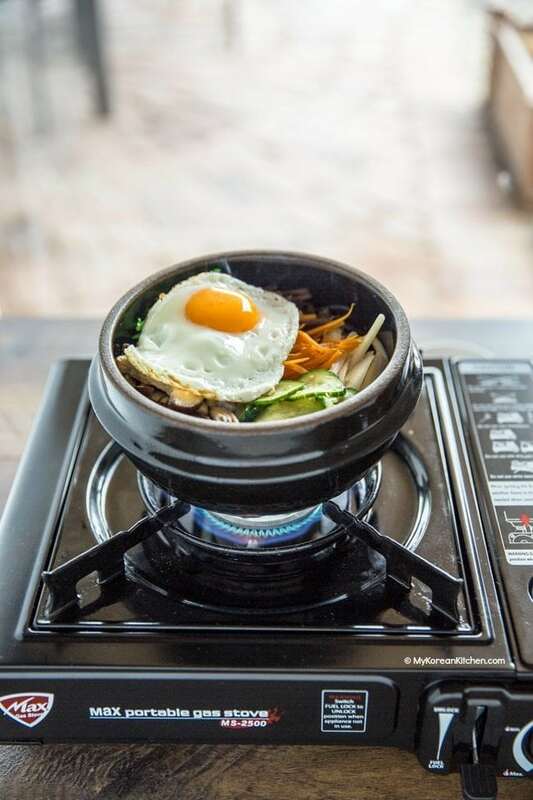 Quickly assemble your bibimbap ingredients inside the hot stone bowl. First you will have to lay down the rice. Make sure you flatten it well. Then add the meat, assorted vegetables, and the egg on top of the rice. Transfer the hot stone bowl onto the gas stove and cook it for 5 minutes over low heat. You will hear the rice crackling noise. Remove from the heat. 3. Pour the bibimbap sauce into the hot stone bowl and mix all the ingredients well. Serve. Prepare and cook ingredients as below. Preheat an oven for 10 minutes at 220 C / 428 F. Once heated, place your stone bowl into the oven. Leave it there for 10 minutes. 10 minutes later, take it out. Drop in some sesame oil (about 1 Tbsp per medium size bowl) and brush it around. 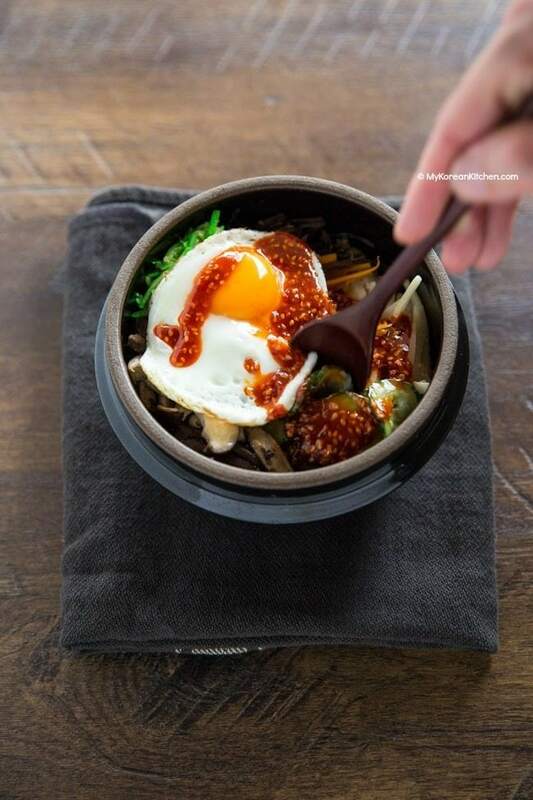 Quickly assemble your bibimbap ingredients inside the hot stone bowl. First you will have to lay down the rice. Make sure you flatten it well. Then add the meat, assorted vegetables, and the egg on top of the rice. Transfer the hot stone bowl onto the gas stove and cook it for 5 minutes over low heat. You will hear the rice crackling noise. Remove from the heat. 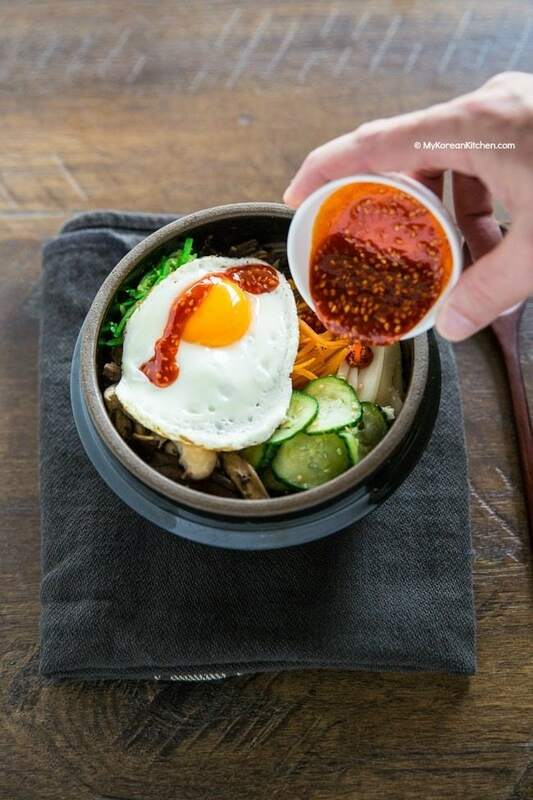 Pour the bibimbap sauce into the hot stone bowl and mix all the ingredients well. Serve. ** Handle with care while transferring the hot stone bowl. *** Prep and cooking time does not account for the making of Korean vegetable side dishes (Korean cucumber side dish, fernbrake side dish and bellflower root side dish) as I made my bibimbap with leftover side dishes. You can get small cast iron casserole dishes that would be perfect for this. As usual everything perfect. The way you put the recipes I can understand them well. Everything about this is FANTASTIC!!! Is there a brand that you prefer for the stone pot. We love making tofu stew and bibimbap. Do you think it would work if I use a clay pot instead? What kind of clay pot is it? Does it look like mine? Mine is made with clay but it’s classed as ceramic pot. As long as your clay pot is oven safe and stove safe it should work. I bought the same pot you have. Does it only work on a gas stove? But I can still put it in the oven? Yes, you should be able to. Just follow my recipe above. 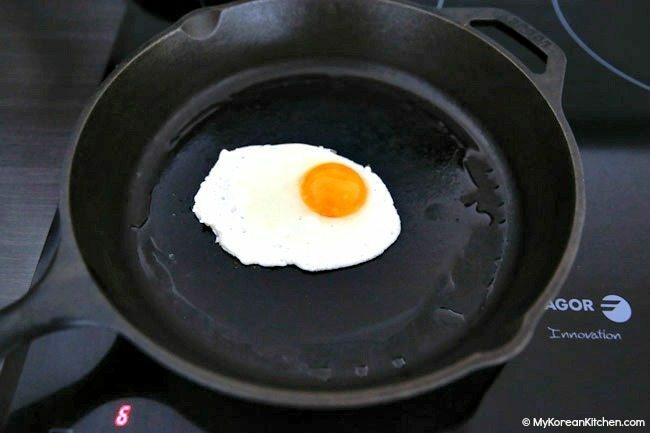 In case you’re not aware, you do need to cook it over stove for 5 mins once all the food is in a pot. I love bibimbap. I’ll have to give this a try. I browned off some ground pork then added the DOLSOT BIBIMBAP SAUCE ingredients to it and let it simmer for a while. Then made some rice paper rolls with the mixture along with some rice noodles and bean sprouts. Soooo tasty. Thanks for a great site, I love it ???? Such. Beautiful photos!!! I never knew about the pot – fascinating! I probably can never make this because I can’t find all of the ingredients, which is sad because I would so love to taste it! Mimi, you can alter the vegetable ingredients based on what you have. That’s the beauty of bibimbap! 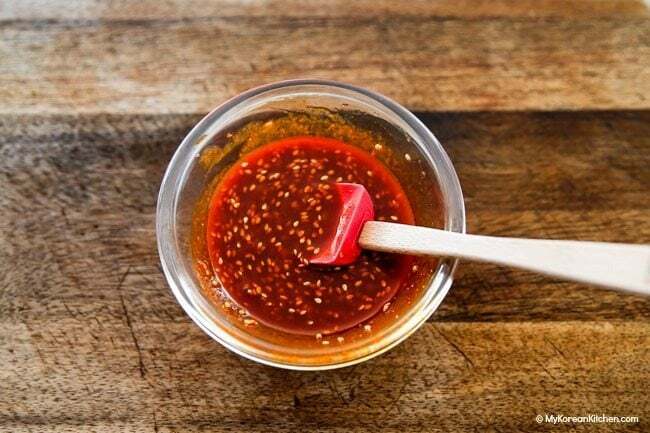 The only “Korean ingredients” you will need would be gochujang / Korean chili paste! Hope you get to try it soon. I have made the basic BIBIMBAP many times over the years and it was very easy and delicious. I have never prepared Bibimbap with Gosari and Doraji as I do not stock these two items (sold in 8 oz. pouches) since they are easily perishable and must be consumed quick. The sauce in this recipe is excellent and easy to prepare. Thanks for the updated recipe!!! This was my first time using gosari namul & doraji namul in my bibimbap too. It’s definitely an effort to go though. But I wanted to share the traditional bibimbap ingredients. After all, I’m a food blogger! Lol. Anyway, you can try using dried gosari & doraji to turn them into namul. They last a long time (like a year or so). Love your recipe – have been making it for the last year or so to rave reviews. We like to break the raw egg into the dolsot on top of all the ingredients at the last minute – when you stir the rice it all mixes together to create some serious umami! Thanks! Great to hear that. For whatever reasons, I don’t like mixing in a raw egg even if it gets cooked in my dolsot. 🙂 But for sure, it’s one of popular way to serve egg in bibimbap! Yummy. Thank you for this recipe, I love Bibimbap. Hope you make one soon!